Birthdays are fun, most of the time anyway. Celebrating birthdays with girlfriends is always fun. It is a chance to catch up and laugh about getting older, because laughing is better than complaining. Last week a few friends gathered to celebrate a birthday by having lunch together at my house. 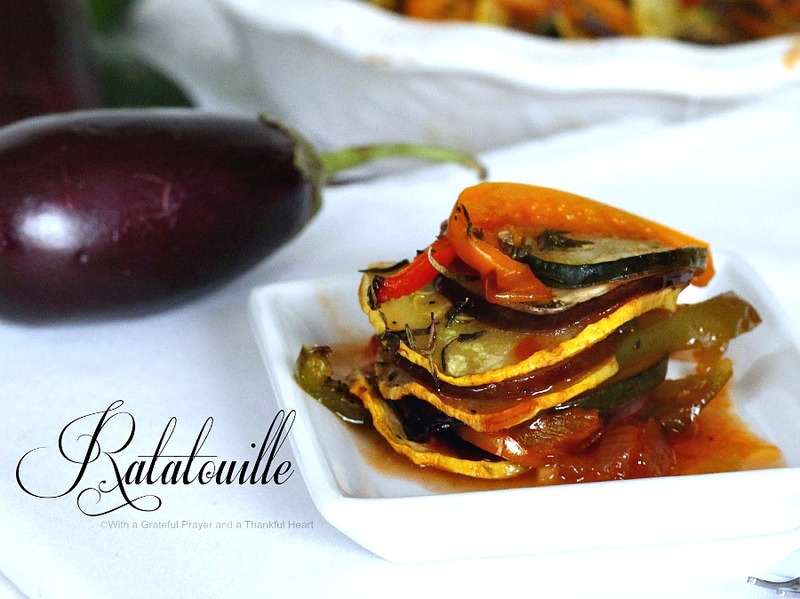 Ratatouille was part of a French-themed menu I planned and we pretended we were in Paris! Food is often part of celebrations big or small. It is easy to have conversations while seated around a table together. More than just celebrating the birthday girl, we celebrate our friendship. 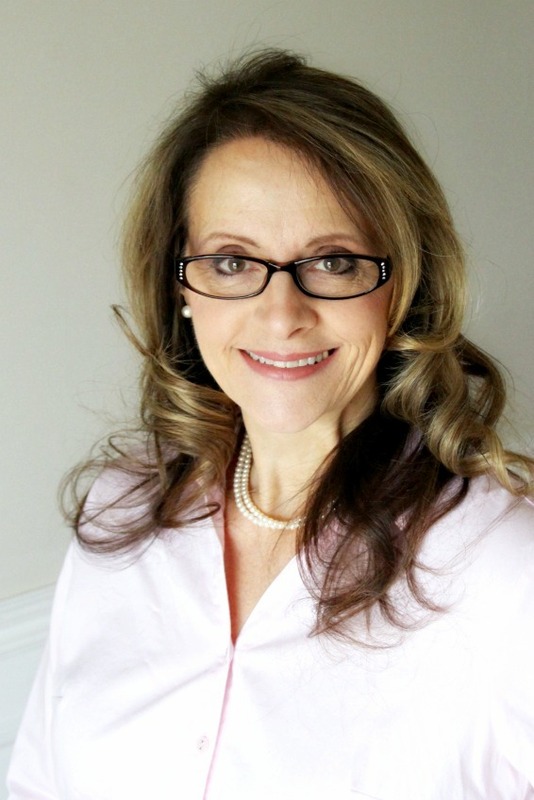 We have shared many birthdays through the years and it is a special time filled with laughter, stories and up-dates about our children, grandkids and life in general. There is always encouragement, joy and gratefulness for each other with these sweet ladies! 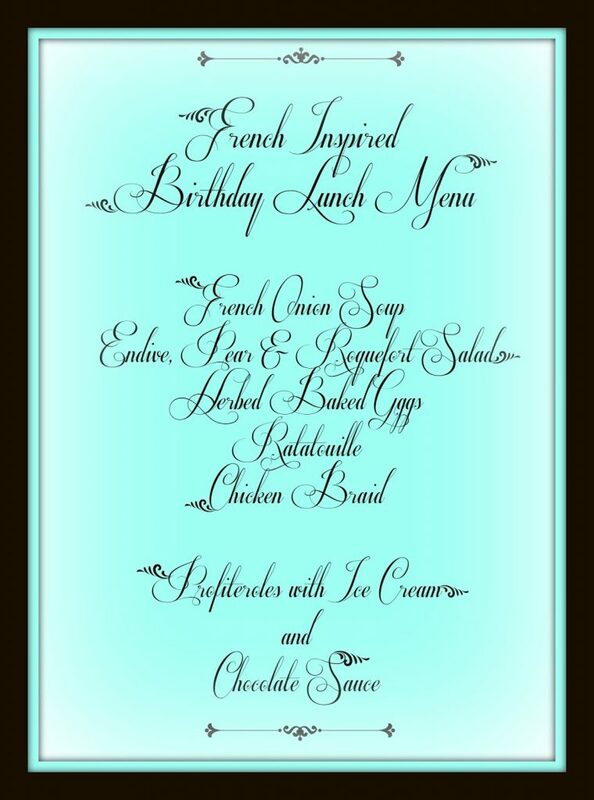 Here is the complete menu. It was really fun and worth the time. I think one of my love gifts is food and it brings me joy to cook for others. I imagine many of you feel the same way and prepare gift foods for others by making and sharing cookies, breads and treats, especially around the holidays. Two of our grandchildren came the day after our lunch for a sleepover and they tasted what was left of the Ratatouille. Was I surprised that they liked it and wanted to make more. I made a few changes to the original recipe so we could compare and decide the version they liked best. Kids love to cook and were so excited to make the recipe themselves. Later that evening, we all curled up on the sofa to watch Disney’s Ratatouille movie and enjoyed the warmth of the first fire of the season in the wood burning stove. Ratatouille and popcorn makes a kid happy. Who would had thought. Keri and Caleb (that’s his fingers in the top photo) prepared the Ratatouille themselves. The original recipe uses a can of tomato paste mixed with water and produces a thick, rich, bold tomato flavor with a deep color. We tried substituting an 8-ounce can of tomato sauce for the tomato paste and did not add water. We also tossed in a few thinly sliced mushrooms because I had some in the refrigerator that needed to be used. As expected, it was more mild-flavored but still tasted good. After tasting both versions over and over, we finally concluded we liked the original recipe a just little bit better. 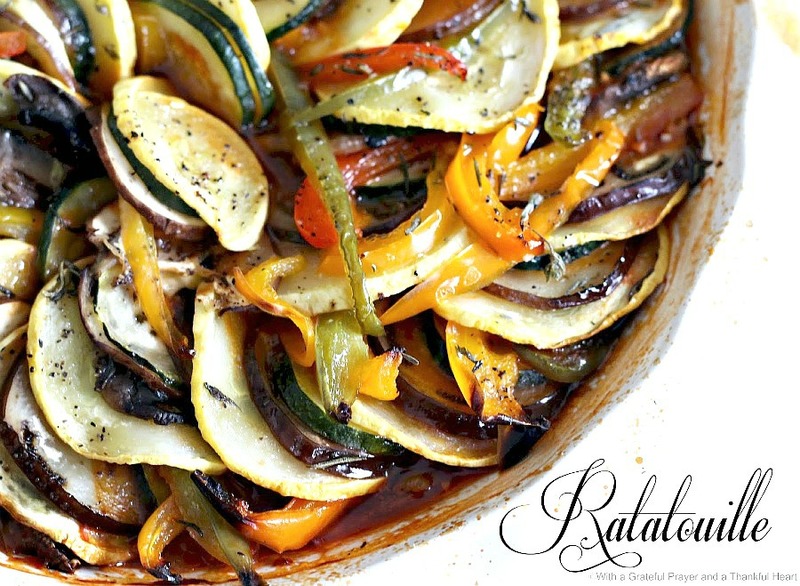 Whether you are planning a fancy lunch, need a delicious side dish or want to cook with your kids, give Ratatouille a try. Spread tomato paste into the bottom of a 10×10-inch baking dish. Sprinkle with onion and garlic and stir in 1 tablespoon olive oil and water until thoroughly combined. Season with salt and black pepper. 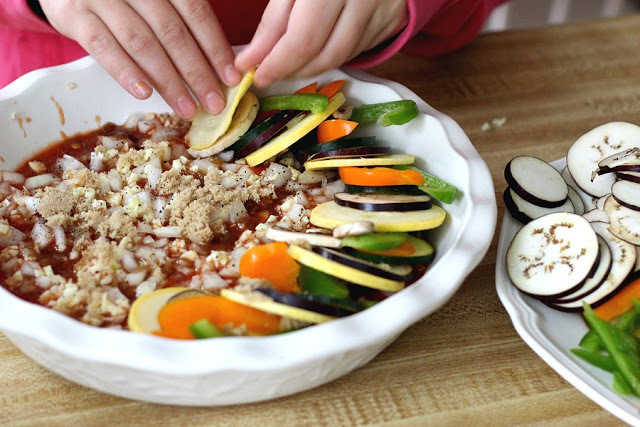 Arrange alternating slices of eggplant, zucchini, yellow squash, red bell pepper, and yellow bell pepper, starting at the outer edge of the dish and working concentrically towards the center. Overlap the slices a little to display the colors. Drizzle the vegetables with 3 tablespoons olive oil and season with salt and black pepper. Sprinkle with thyme leaves. Cover vegetables with a piece of parchment paper cut to fit inside. Bake in the preheated oven until vegetables are roasted and tender, about 45 minutes. if desired, serve with dollops of mascarpone cheese. 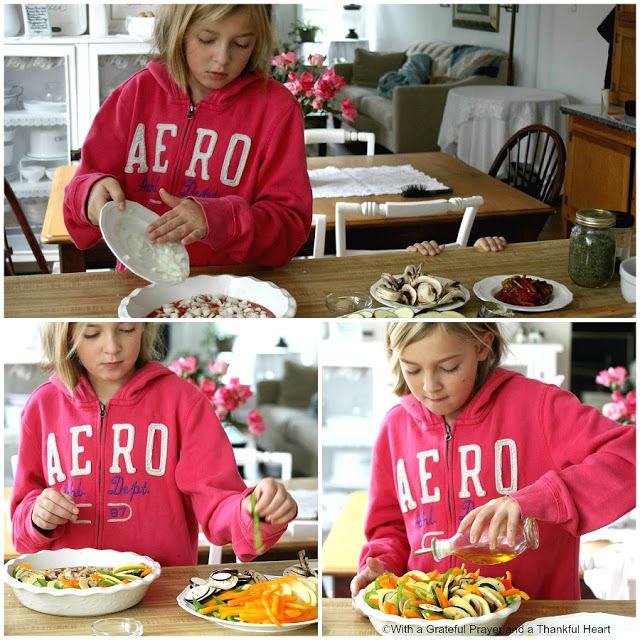 I love this French salad and I will try yours, sounds great and looks it too! How wonderful you will have all your beautiful family for Thanksgiving…there's already a reason for thanks! 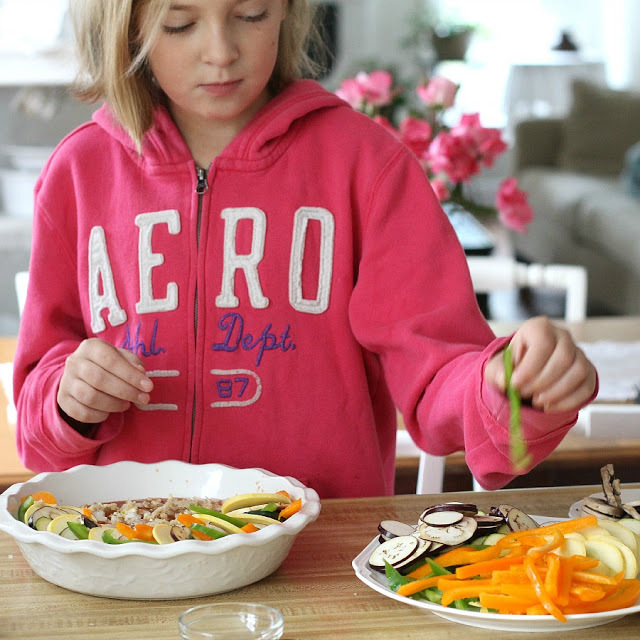 Keri looks like she's well on her way to become a great cook. As a vegetarian, this is a dish that I LOOOOOOOOOVE !! Love ratatouille. I usually chop mine veggies smaller but yours is a much more attractive dish. I will have to try your recipe.